Heat oven to 350°F. Spray 9-inch round cake pan with cooking spray. Open can of rolls. Remove cover from icing; microwave on Medium (50%) 5 to 10 seconds or until thin enough to drizzle. In small bowl, mix icing, melted chocolate chips and corn syrup. Spread in bottom of pan. Separate dough into 5 rolls. Cut each roll into quarters. Arrange over chocolate mixture. Bake 28 to 32 minutes or until deep golden brown. Turn pan upside down onto heatproof serving plate. (Replace any topping in pan onto rolls.) 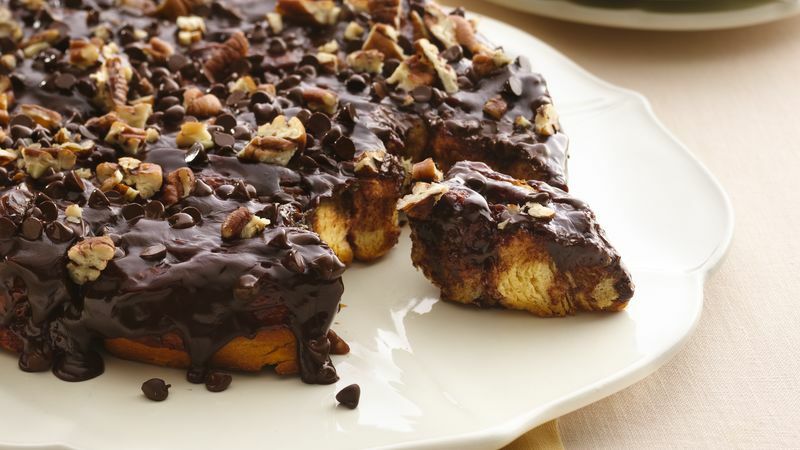 Immediately sprinkle with chocolate chips and pecans. Cool 5 to 10 minutes. Serve warm. Substitute chopped walnuts for pecans if desired.